You Won’t Believe How Much Shah Rukh Khan And Salman Khan Charged For Hosting Together! Fans and media went berserk over the news of Shah Rukh Khan and Salman Khan sharing the stage. Last time it happened was on the stage of Bigg Boss last year where Salman was the host and SRK was the guest. But this scene was totally different. The two superstars agreed to come together for hosting Star Screen Awards and posed for the paparazzi. Coming to the important news, how much did they get paid for this gig? A whopping amount of INR 3 crore each!!! Yes, the organizers had to shell out a bomb for this Karan-Arjun milap. The two Khans decided to align on their fee so as to avoid any competition or complications. This Khan duo surely knows how to keep the buzz between the two alive and this must have worked in favour of the organizers as that has singly become the talk of the town. Earlier this month, Salman Khan unveiled the first look of Shah Rukh Khan’s upcoming film with Imtiaz Ali and Anushka and announced its release date as well. 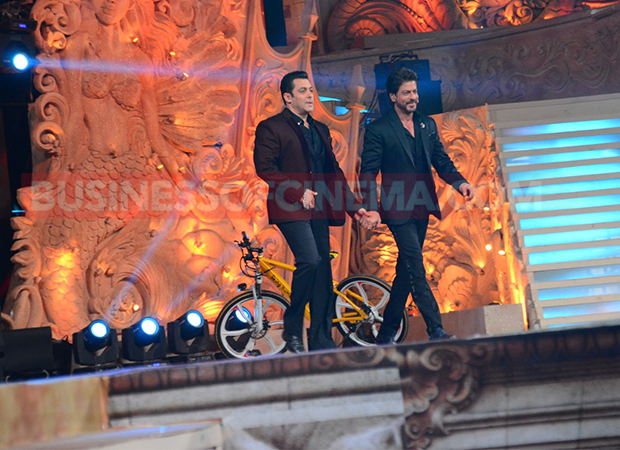 While on the red carpet to both Salman and SRK looked at ease and even hinted at working together in a film. If this news is true, we cannot wait to see them sharing the screen space and creating magic! !